Different to the rest of the Sarpo family, Una is a second early. Ready to harvest as early as mid-June onwards, it is an ideal variety for potato sacks and pots. This waxy, delicately flavoured variety works perfectly as a salad potato hot or cold, or when harvested late it makes for a great baker. The pink tubers also store well. As expected from all Sarpo varieties, it has excellence resistance to late blight as well as a range of other diseases and drought. 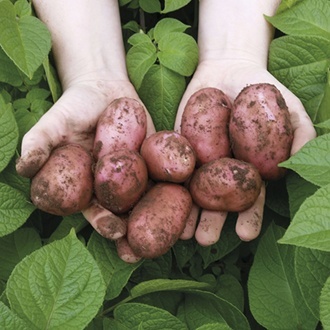 Plant chitted tubers in early April (earlier in warmer areas) and start harvesting from early July and through August. Growing your own potatoes is incredibly rewarding and so easy to do! Our carefully selected range has a spud for every occasion, with varieties chosen first and foremost for their flavour and reliability. We are committed to supplying only the highest quality seed potatoes! In the main, we will only offer seed potatoes produced in mainland Britain, which are certified by either SEERAD or DEFRA and sorted to riddle size 30-60mm. All of our seed potatoes are certified ""Safe Haven"" or equivalent status. The Safe Haven Certification Scheme provides protection for the British potato industry and its customers from bacterial ring rot and other harmful organisms like brown rot and soft rots caused by Dickeya species. The scheme ensures that all seed is only grown from Safe Haven sourced seed or nuclear stock and this helps protect against any pests and diseases which affect potato and are not found in Britain. All our customers can therefore be assured of first class quality seed potatoes for their gardens and allotments.